Those who follow our Twitter account will have read this morning about the mass of sound coming from drills, saws, hammers, scraping ladders and the movement of holds. It has been a very busy morning in here. First up is that the Green Spotty circuit is now no more. 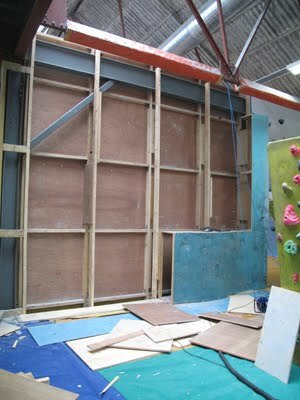 It has come off the wall, ready for the holds to be used for our very special Young Climbers Festival that will be held next Thursday. 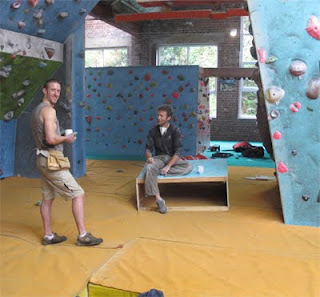 If you've got children who climb, this is a must-do event. There is a few places remaining so read up and get your booking in. Next up is Sam's new Yellow Spotty circuit which he is currently completing. This will be in the Font 4-5 range and should be all done by later today. Finally we've had the main cause of all the noise in here today, the removal of the Wavy wall. You can see the process in stages in the photos below but in essence, a lot of power tools were used in its removal. What will come its place? Keep an eye on our blog and find out next week.